Mr. Kumarmangalam, is a 40 year old man, who works as a paramedic in India's Information technology capital, city of Bengaluru. His wife, Maya is a nurse and works in Lion Club Eye hospital in the city. They have an eleven year old son studying in school. Kumarmangalam family used to stay in a modest single story house built on a plot of land, measuring about 80 ft X 30 ft area, which they have inherited from Mr. Kumarmangalam's father in the Kaveri Nagar area of the city. On Monday, 29th July 2013, while Kumarmangalam and his wife both were at their respective work places and their son at his school, he received a phone call on his mobile phone from one of his neighbours. 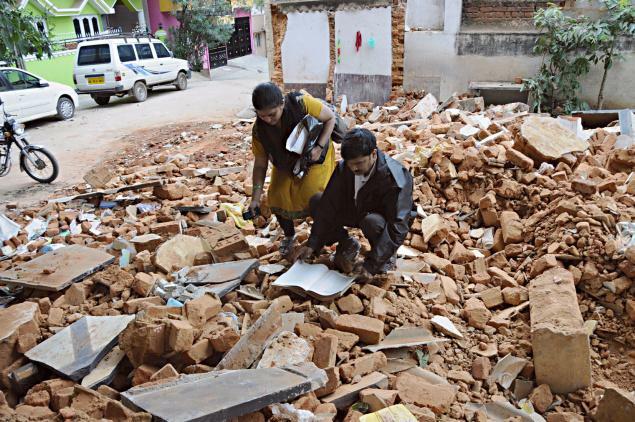 Kumarmangalam's world came crashing down as he heard the news on telephone that his modest house was being demolished by a group of 20 people equipped with a bulldozer, in full view of the police. Kumarmangalam rushed home to find out that his home was now a heap of rubble and people were looting his belongings buried in the rubble. Everything the couple owned, furniture, television, refrigerator, laptop and household articles was gone. Kumarmangalam tried to confront the demolition crew, but he was assaulted, and when he tried to make a call on his mobile, one of the hired goons snatched the phone and gave it to a boy who ran away and disappeared into the crowd. The worst part of the scene was that the the jurisdictional D.J. Police were present on the spot, when the house was being bulldozed. They were however restricting themselves only to crowd control, that was looting the house. Mr. Kumaramangalam then rushed to the nearest police station to file a complaint, the police refused to register a case, saying it a civil dispute. As a last resort, he made a dash to the office of the Police Commissioner of Bengaluru, Raghavendra H. Auradkar, seeking help. Only after that, the complaint was registered. A childhood friend offered help and allowed the family to stay at night in his house, but his house is too small with one bedroom. The Lion Club Eye hospital where his wife works as a nurse, has offered to provide shelter to the family and his relatives from Ernakulam (Kerala state) are expected to visit him to help. However, Kumarmangalam wants to build a make shift house on his plot and again start living there. 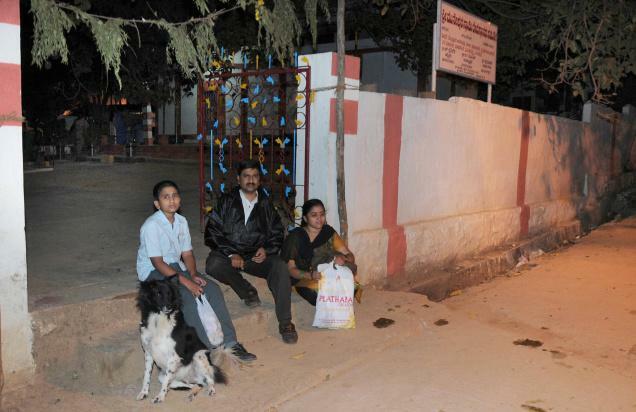 Kumarmangalam is however now really scared about the safety of his family. He says “I have lost my house in which I grew up. Now, I do not want to lose my family. What if they kidnap my son and harm my wife to take revenge on me for filing a complaint.” Additional Commissioner of Police (Law and Order) Kamal Panth now says that eight persons had been arrested so far. An investigation has been ordered to ascertain lapses on part of the police in handling the situation. I find the whole incident truly shocking and difficult to imagine even. I wonder, what kind of rule exists in Bengaluru now? Are state legislators above the law and can do anything unlawful at their own sweet will? Preventing such kind of mafia behaviour and protect ordinary citizens from human rights abuses is the first duty of the state. The state Government should immediately compensate Mr Kumarmangalam for the losses and the amounts should be recovered from culprits, whosoever they may be? Is it too much to expect? One thing is crystal clear however, Bengaluru city is no longer a heaven for the pensioners and the middle class, as it was about 50 years ago. It is now ruled by mafia. That's shocking and disturbing. If this is the case with Law and Order in IT city of India, is there any hope for ordinary towns and rural areas at all?